The past weeks have been a roller coaster of national drama for us Filipinos. We have been stormed by the ongoing investigation on the notorious Bilibid drug trade, which has several interesting subplots, as well as the sudden and controversial burial of the late president, Ferdinand Marcos, at the Libingan ng mga Bayani, which prompted protests from the anti-Marcos groups. Although it is tempting for me to pull the history card once again for this month’s article, I opted to settle with an equally stimulating subject of sociology. Randolf “Randy” David’s book, Nation, Self and Citizenship is an invitation to Philippine sociology, and helps us to learn more about ourselves and society. To give a short background about the author, sociologist Randy David is also a journalist. He maintains an opinion column called “Public Lives” on the Philippine Daily Inquirer. He is married to Karina Constantino David, also a sociologist and a former public servant, who is the daughter of the renowned Filipino historian, Renato Constantino. Journalist and television host, Kara David, is one of their children. Nation, Self and Citizenship is an anthology of the early “Public Lives” columns, compiled according to different perspectives from which we view the changing realities of our society. I read the book twice: first, for leisure and, second, as a reading requirement for a sociology class under Josephine Dionisio, one of the co-authors of the book. That sociology class was one of my favorites in college. It was thought-provoking, mind-blowing and eye-opening! Hence, with the introductory essays by Josephine Dionisio, Gerardo Lanuza and Arnold Alamon, I assure you this book has the same effect. Not convinced? Well, here are more reasons you should grab a copy! Any sociology class would not be complete without knowing C. Wright Mills. He is the usual first reading assignment, as he was the one who coined “the sociological imagination,” the ability to view social reality as it is projected from three coordinates—history, society and biography. It is a basic sociological term which essentially means the capacity of the individual to understand personal circumstances in relation to the structures of the society. That’s the common perception—people remain poor because they are lazy. They don’t work hard enough. They just want to drink beer with their belly out all day long! But that’s a misconception. There are people deemed poor who are the hardest workers but remain poor. As Ma’am Jo says, “If only one person out of a million people is poor, he or she is the problem. But when there’s a million people who live in poverty, are they the problem?” Now, that’s a sociological question. Poverty pervades our society. It is something very close to us. We see vagrants everywhere, we see the sea of slums behind high-rise buildings, or we even experience it ourselves. These social ills—broken families, mediocre education, corruption, rundown infrastructure and ailing economy—are not mere abstractions. They are real problems that we witness every day. Thus, there is an urgent need to understand society and that’s exactly what social sciences, like sociology, do. Instead of thinking about Humanities and Social Sciences, or HUMSS, as more of a hobby, why not view them as relevant intellectual pursuits that can offer practical solutions to real world problems? The questions “Why Filipinos remain poor?” and “Why we elect bad leaders,” which is one of David’s columns are concrete examples of why we should give equal value towards humanities and social sciences… and science, technology, engineering and mathematics. Through the sociological imagination, the realization that our struggles are not only isolated within ourselves but rather deeply ingrained in social structures, we will be able to connect the dots and question the status quo. Ask why bad things happen. Ask why nothing’s going right, and raise relevant questions about our society. We should understand ourselves even better through the sociological imagination. Let us find our purpose in the society. 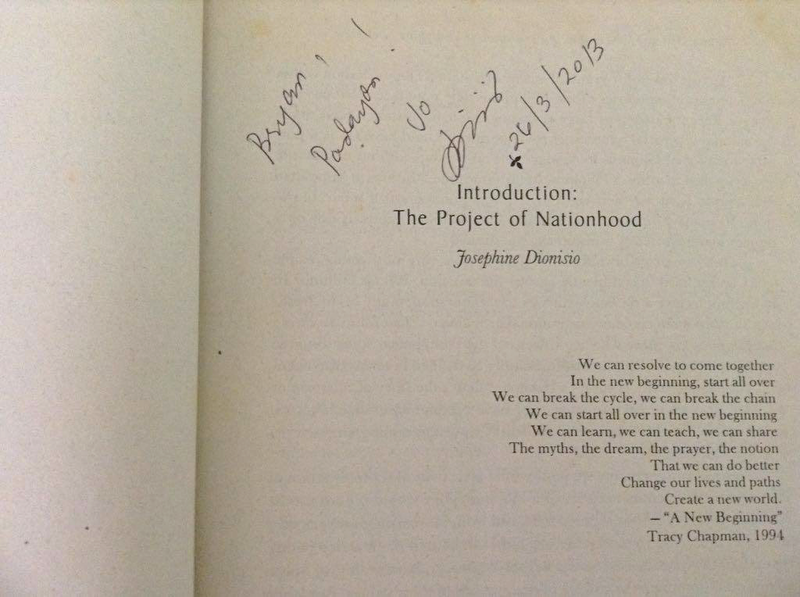 As the book suggests, the Filipino is an unfinished business. What are we going to contribute to our quest towards nationhood? What makes Filipino a Filipino? What does Pinoy pride really mean? Does being proudly Pinoy mean being proud every time boxing champion Manny Pacquiao wins a bout? Does Pinoy pride mean being honored that the friend of the mother of the sister of the cousin of the nanny of Ariana Grande is half-Filipino? Or that Selena Gomez is related to Richard Gomez? Pinoy pride! More importantly, the book reminds us of our humanity. It reminds us that we have the social responsibility to our kapwa, and that we have the obligation to act for the benefit of society at large. We should not be oblivious of our task to teach our children values, to teach them what is right and just. We should not forget of our duty to remember the past. We must not stop asking why bad things keep on happening and what we can do to change it. It is our responsibility to understand and to collectively act accordingly for the sake of our future as a nation. Hello, Mariz! We saw a copy at National Book Store. Hoping you are able to find one! Thank you for reading.